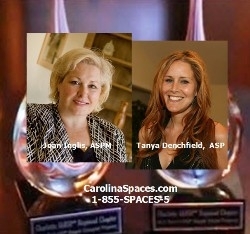 Carolina Spaces LLC, a full service home staging, model home merchandising, and interior design firm in business over a decade and based south of Charlotte, NC, won two awards for Best Staged Properties of 2014 from Charlotte Regional Chapter of International Association of Home Staging Professionals. Charlotte, NC, March 14, 2015 --(PR.com)-- Carolina Spaces, the internationally recognized home staging company serving homebuilders, Realtors, real estate investors, and homes sellers, added two additional awards to its numerous list of accolades. Joan Inglis, Master Accredited Staging Professional (ASPM) and Principal, and Tanya Denchfield, Accredited Staging Professional (ASP) and Sr. Designer, each won an award for best home staging of 2014. Joan won Best ASPM Staged Vacant Property for furnishing and staging a model showcase home by James Custom Homes of Matthews, NC. Tanya won Best ASP Staged Occupied Property for staging a resale home in Charlotte. The awards were given by Charlotte International Association of Home Staging Professionals Regional Chapter, where Joan serves as chapter president, and Tanya serves on the chapter board of directors. "Tanya and I are thrilled to have won awards from our local staging chapter and be recognized as the best in our local industry market," Joan said. Joan Inglis has won over a dozen local, regional, state and international awards including The Barb Schwarz ASPM Staging Excellence Award 2014, the highest award in the home staging industry. Carolina Spaces is based south of Charlotte and serves all of North Carolina and South Carolina, and also offers nationwide service or referrals. In addition to providing home staging, model home merchandising and interior design, the firm also offers furniture sales and custom furniture and upholstery design. Joan Inglis has been featured in dozens of local, regional, and national publications including Realtor Magazine - the official publication of the National Association of Realtors (NAR). Joan is an interior designer, an Accredited Staging Professional Master, and a model home merchandising professional. Joan is also a licensed Realtor (with CD Realty) in North and South Carolina. To learn more about Joan Inglis and Carolina Spaces or to contact her for assistance, visit www.CarolinaSpaces.com or call 1-855-SPACES-5.